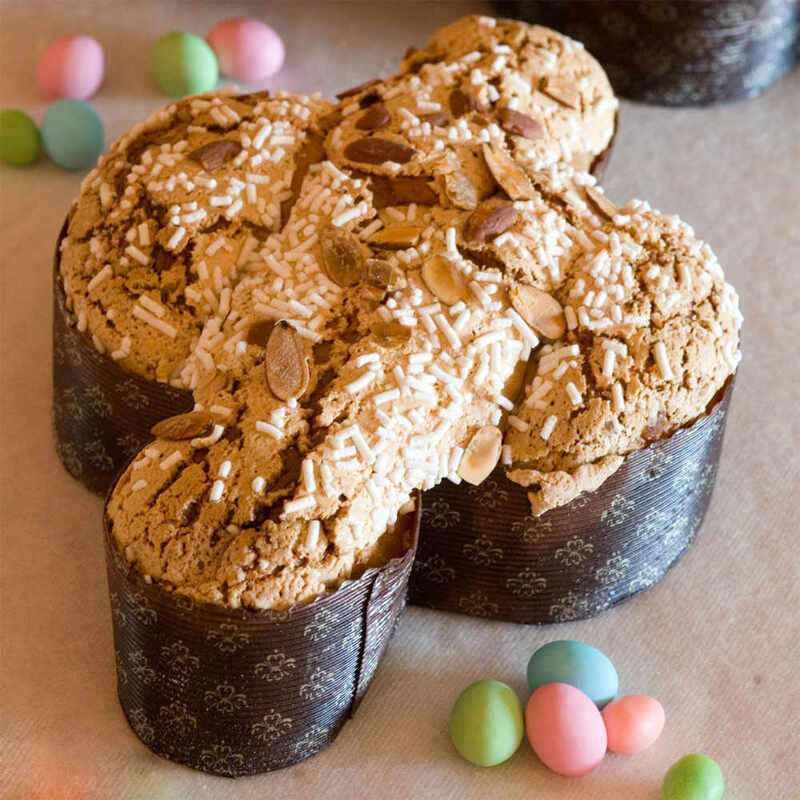 Colomba Pasquale (also Colomba di Pasqua) is a naturally-leavened cake with a soft texture. 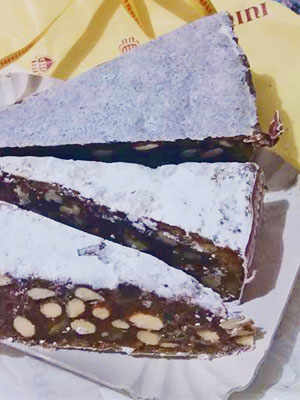 In Italy they are traditionally eaten during Easter/Passover (Italian: Pasqua), which led to its name “Colomba Pasquale” (Roughly “Easter Dove”). It is a delicate and fragrant cake baked into an elliptical, dove-like shape, and is enjoyed throughout Italy. Colomba Pasquale is a registered PAT (was unsure of how to anglicise the full term) product, which means that its characteristics and ingredients are regulated by Italian Law, and its packaging must feature the word “Colomba” under the same regulations. 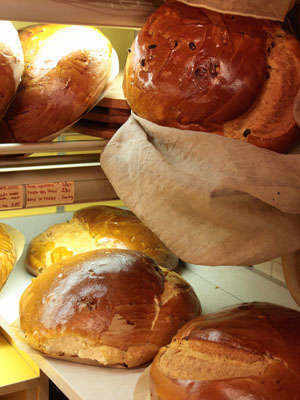 The shape of Colomba Pasquale is unchanged since it was standardised in the 1930s. However, at that time the ingredients were simply flour, eggs and yeast. Since 1944, recipes that are more commonly found today in Italy began to spread. These included the use of raisins, candied fruit peel, icing, marzipan and amaretto. 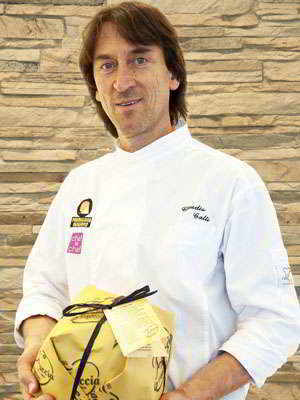 There are several legends related to the origin of Colomba Pasquale. The oldest of which dates to the 6th century, when King Alboin (Former King of the Lombards) lay siege to the castle of Pavia. It is said that when the castle surrendered, he was offered a dove-shaped sweet bread as a symbol of peace. There is another legend of the same time period which attributes its origin to a story involving former Lombard Queen Theodelinda and Irish Saint Columban. It is said that St. Columban and his disciples arrived in Pavia in 612 in the middle of Lent, where the monks were welcomed by her majesty with a royal banquet. However, with Lent being a period of penance and fasting, St. Columban and his entourage denied to partake of meat. This offended Queen Theodelinda, who did not understand the reasons for their refusal. Thus St. Columban attempted to appease Her Majesty, saying that the monks could not consume meat until it had been blessed. Thereupon he raised his right hand in the sign of the cross, at which point the meat turned into dove-shaped bread as white as their monastic robes. This miracle greatly impressed Queen Theodelinda, and she donated to him the land of Bobbio, now known for Bobbio Abbey (in now Emilia-Romagna). This is said to be why the dove is an iconic symbol of the Saint and why it is always depicted behind him. A sign of good quality Colomba Pasquale should be soft when cut into, revealing a honeycomb of air-pockets, and with an aroma of yeast, citrus fruits and vanilla. The taste is sweet with light hints of acidity. The outside is crisp while the interior is soft and fluffy. 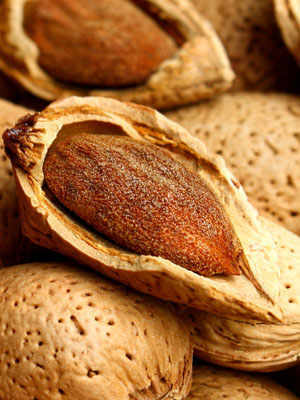 It is best tasted when paired with sweet wines, such as Moscato d’Asti, Oltrepò Moscato or the raisin wine Passito di Pantelleria.